Charlie born in March 1957, married to Shirley since 1986, has 3 children and 5 Grandchildren (3 girls 1 boy) and another on the way. Charlie is a keen runner since 2007, wanting to improve his fitness and lose weight! Charlie has been fundraising and supporting UK Charities for the last 10 years. He has completed 17 marathons, 3 Triathlons and numerous other races including; The Great North, Great South, Great Cardiff and Great Edinburgh Run’s. He has cycled around Britain, with his Brother-in-Law (Nigel Derrett) almost 2500 miles, for the Alfie Gough Trust, receiving brilliant; community, family and The Trust’s support. Charlie works as Operations Manager for a busy local family run commercial laundry (K Laundry LTD). Charlie brings health and safety experience. He has completed many training courses and taken numerous qualifications (IOSH H&S Technician). 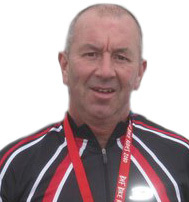 He was a Health & Safety trainer within the Prison Service and in local community in Health & Social Care, he also has a H&S qualification for UK Athletics. Charlie helped set up ‘Alfie’s Striders’ which is a family friendly running group (part of the charity) designed to encourage everyone to jog or run together, also where possible, to raise funds. Charlie is very passionate about raising money for the Alfie Gough Trust and other charities. Charlie would love to see more people give and get involved with The Alfie Gough Trust, without your help we can’t help ‘others’. We will shortly be going to print for the 2015 edition of this magazine. Do you wish to place an advertisement? A full page costs £120, a half page £64 and a quarter page £36. Charlie remember me. worked under you in hnp Canterbury running your virgin Atlantic workshop with all the dodgy Vietnamese folk. at which point we started the b&q plastic piping contract. Charlie I would love for you to get in touch with me either on this email or my private number 0027722629460 as crazy as this seems I have thought of you often in a positive impact you had on my incarceration and to the point where I find myself today. line regard yeah bruv get in touch.